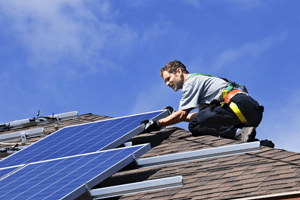 How Much Do Home Solar Systems Cost? The basic thing to know is that installing solar systems breaks down to installation and operational cost. The solar panels themselves can cost around $4,000 to $15,000, and they make up between 40% and 50% of the total. Besides panel installation, other necessary system components include mounting hardware, a power inverter, and electrical components like wiring. Operational costs include monitoring, maintenance, repair, insurance and overhead costs – typically $4,000-$8,000. This is a cost category where there is a lot of potential to cut costs. Not all systems will require monitoring and you can probably get away with very little maintenance. Hopefully you will never need any repairs. There’s a big government supported incentive to install solar energy with tax credits for up to 30% of the cost. Depending on where you live, your city or energy company may provide rebates or might even help you secure a low-interest loan. Find out which rebates are available in your area and how much you can save.